INCIRLIK AIR BASE, Turkey (AP) - The U.S. will send two batteries of Patriot missiles and 400 troops to Turkey as part of aNATO force meant to protect Turkish territory from potential Syrian missile attack, the Pentagon said Friday. Germany and the Netherlands have already agreed to provide two batteries of the U.S.-built defense systems and send up to 400 German and 360 Dutch troops to man them, bringing the total number of Patriot batteries slated for Turkey to six. German lawmakers voted 461-86 Friday to approve the deployment of two Patriot missile batteries. The mandate allows Germany to deploy a maximum 400 soldiers through January 2014. NATO foreign ministers endorsed Turkey's request for the Patriots on Nov. 30. INCIRLIK AIR BASE, Turkey (AP)  The U.S. will send two batteries of Patriot missiles and 400 troops to Turkey as part of a NATO force meant to protect Turkish territory from potential Syrian missile attack, the Pentagon said Friday. He said he approved the deployment "so that we can help Turkey have the kind of missile defense it may very well need to deal with the threats coming out of Syria," he said. The U.S., Germany and the Netherlands are the only NATO members who have the upgraded PAC-3 missiles, capable of missile interception. Each battery has an average of 12 missile launchers, a NATO official said, speaking on condition of anonymity because alliance regulations do not allow him to speak on the record. In a statement issued Friday NATO spokeswoman Oana Lungescu said "the deployment will be defensive only." "It will not support a no-fly zone or any offensive operation. Its aim is to deter any threats to Turkey, to defend Turkey's population and territory and to de-escalate the crisis on NATO's south-eastern border," Lungescu said. Earlier this week in Berlin, German Deputy Foreign Minister Michael Link told lawmakers that current plans call for the missile sites to be stationed at Kahramanmaras, about 60 miles north of Turkey's border with Syria. Dutch Prime Minister Mark Rutte said Thursday that the Netherlands, Germany and the U.S. are working closely with Turkey "to ensure that the Patriots are deployed as soon as possible." But he predicted they would not become operational before the end of January. Turkey joined NATO in 1952, three years after the alliance was formed. At Incirlik Air Base, about 60 miles north of the Syrian border, an Air Force member asked Panetta what the US would do if Syria used chemical or biological weapons against the rebels. Panetta said he could not be specific in a public setting, but added, "we have drawn up plans" that give President Barack Obama a set of options in the event that U.S. intelligence shows that Syria intends to use such weapons. 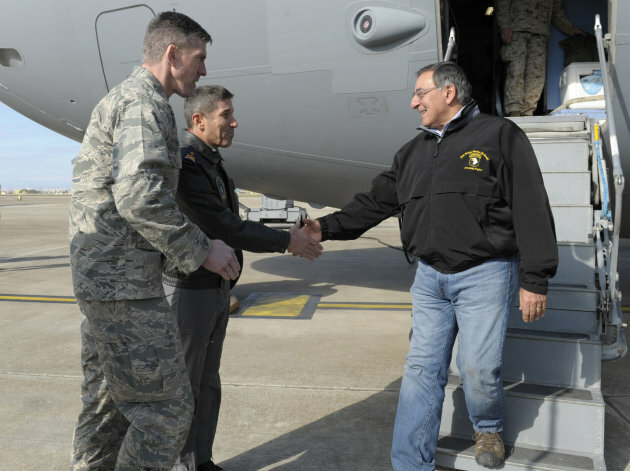 Asked by another Air Force member whether he thought Syria would "react negatively" to the Patriot deployments, Panetta said, "I don't think they have the damn time to worry" about the Patriots since the regime's leaders are struggling to stay in power. He indicated that Syria's reaction to the Patriots was not a major concern to him. Separately, NATO will deploy its Airborne Warning and Control System aircraft, or AWACS, to Turkey on a training exercise this month, the NATO said. It is getting ugly out there. I see it very bad for President Assad. Wanacho tafuta ni kisingizio cha kuingila mambo ya ndani ya Syria, nahisi kisingizio kitatokana na kusingizia Asaad kwamba kawashambulia waasi kwa kutumia mabomu ya sumu - basi hiyo ndio itakuwa kisingizio cha nchi za NATO kuanza kuishambulia Syria kwa kumlenga kumaliza Asaad kwanza, alafu ma General Wake wajeshi nk. Baada ya kumuondoa madarakani Asaad kitakacho fuatia ni kujitayarisha kwa vita vikubwa zaidi vya kuishambulia IRAN baada ya kupata airbases ndani ya Syria za kutua ndege za kivita za NATO na Israel - kumbuka Syria ni jirani na IRAN kuliko Israel. NATO walikuwa wanamuona Asaad ni kikwazo kikubwa katika azma yao ya kuishambulia IRAN kiraisi. Mbona wanamchelewesha sana assad? Kwan gaddafi walichukua muda mrefu hivi? hao jamaa hawapendi kufa.ni waoga sana wanasubiri watafuniwe alafu wao waje kumeza. Wakishaona wamenyong'onyeza vya kutosha asad ndo utawaona wanaingia na ndege zao kuharibu infrastructure yote ili baadae wapate tenda za rebulding.